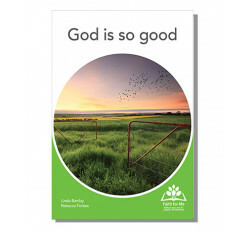 God is so good is part of the Faith for life collection and provides evocative photos matched on each card to clear and familiar devotional moments celebrating the goodness of God. Each of the A5 cards in the set offers a devotion based on a Bible theme with a thought for the day. The beautifully designed cards can be used one at a time, or as many as you like, in any order, by holding the card so that is easy to see for the person with dementia while the support person reads the reflections and prayers on the reverse. The 24 double-sided cards of the God is so good series are printed on sturdy, quality art board and specially coated for extra endurance. They come in a polypropylene satchel for safe storage and transport. A volume discount applies for orders of five or more sets.